We're all familiar with the portrayal of deities that are fairly distant, have their tenets, dispense spells to the worthy, and their agenda is largely executed by their minions. They're fairly easy to do, too. I've once failed (quite thoroughly) at properly portraying a deity that a PC had as patron. Thus: how about deities that have a more personal approach, though? How would one go about playing NPC deities that have a more personal note? What are the do's and don't s? What are good ways of maintaining a personal note while still maintaining the divine, otherworldly, aspect of the deity? How does one go about being able to meet the deity face to face, yet still maintaining mystery and faith? How does one best implement a deity as a patron, without breaking challenges for heroes? Well, "you can't have it" sort of ends the discussion, doesn't it? I'd like to explore possibilities how it *could* be done. Most examples I have seen of such personal gods in fiction have been largely malevolent, somewhat indistinguishable from possession really. One good example might be from Thieves world where Tempus has a rather rocky relationship with his patron (father?) Vashanka. Vashanka speaks to Tempus either through events or rarely in his mind. You never see Vashanka directly. I think allowing a face-to-face meeting is a bad idea, expect perhaps with a heavily flawed avatar of some type. You pretty much can't avoid Deus ex machina if your god can actually appear and fix things themselves. I _might_ have them appear if the next thing that happened is something really bad happened to them. Val: excellent points. I see that my failure at portrayal can be traced to some of these very things. As for personal appearance: the Greco-Roman mythos is ripe with appearances of deities, yet still - or even therefore - life is ripe with challenge for the heroes. I'm trying to distill the common denominator, and I arrive at the conclusion that this is made possible by the deities being fickle, and ultimately self-serving. They don't have the protagonists' best interest at heart. Now that I think of it, the "Timeo Danaos Et Dona Ferentes" applies to the gods themselves as well: "why is the deity helping me? ", "am I a pawn too? ", "where will this path take me? ", "what do I gain; what do I lose?". *A benevolent deity would have to be limited in the amount of intervention it can offer - by time, power, place, or agenda. There may be divine laws that the deity needs to circumvent to be able to help. *It may be necessary to keep PCs in the dark. For example, to prevent information leaks - the fragile minds of mortals may not be the safest place to store ultimate truths. The biggest issue I have with RPing deities is that the deities always come across as entirely to humane, to close to us. When I think of something vast, powerful, and truly divine, I venture into the Lovecraft mythos. Yes, I know that is my bailiwick, but bear with me. Anything that lives above the human mortal level of existence isn't going to be magic Jesus in a toga, or wearing a winged helmet. These are the weak and whey blooded gods of Earth, the flimsy creations and caricatures of man. 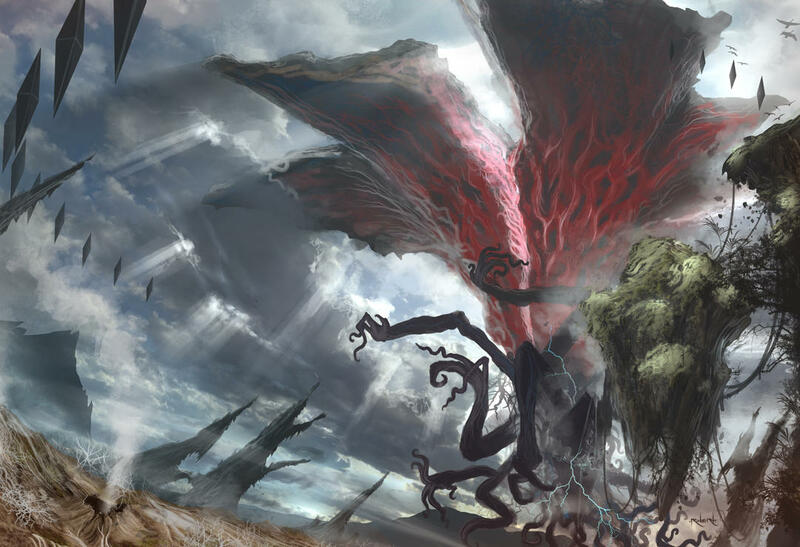 To venture away from Lovecraft, the El Drazi from the Magic the Gathering Zendikar block and fantastic representations of the Divine. They are absolutely not human, and if you were to interact with one, you would be destroyed. Insert the parable about whatever hoochie Zeus was banging who demanded that the leader of the gods show her his true appearance, so he picked his SMALLEST and LEAST impressive lightning bolt, manifested in front of her, and charred her to a Looney Tunes crisp. So, in dealing with something truly divine, you are never actually going to interact with it directly, you will deal with an agent of an agent, possibly of several other orders of agents before you get to something small enough, and compact enough to interact with something as minuscule as a mortal being. You there, ant-thing. You are the ant I have picked. I dont give a s**t what rationalization you come up with to explain why I picked you, I want you to go tell all the other ants in your nest to pack their stuff and get out of my yard. The HOA has a regulation against untreated ant mounds, and I don't like pouring poison on my yard. Ant spreads gospel of the MegaSkyAntGod, is killed by the other ants for being insane. Is proven right when six ant generations later, ant-icide poison rains from the heavens. Ant religion is carried out by the survivors who barely survive to found a new mound a few dozen feet away in the treeline. I think I was going somewhere with that, but it seems like a good place to stop. That's a very good notion - the gods that are closest to man will by definition be the least divine. Any directive from above will filter through layers of divinity before it is simplified and diminished enough to be understood by mortals. You can't understand the god - and it might well break you if you tried. The god you may be interacting with is a minor supernatural entity, and the mystery of the greater deity is not diminished, or is even increased, when that lesser supernatural tells you "I can't fathom him either". This allows you to portray meetings with the lesser servants as somewhat human, because they're made to be so, to be able to talk to ants. Portraying a chance encounter with a greater deity (we'll omit the variety "you are unmade by the presence of the divine") would have be done so that the sense of something utterly vast and incomprehensible comes across undiminished. Care to write a brief paragraph? "You know that hurricane that came out of the blue last year?" "That was Neptune communing with the @!#$ing Athenians..."
Also, if a greater god really wanted to talk to you - and not destroy you in the process - They could. Just as their power would unmake you, they could also take pains not to unmake you. It may not be a pleasant encounter having your body - and soul - ravaged by something that really shouldn't be here, all the while being held together by the attentions of the same being. Could be painful. Might make listening to the actual message difficult, all that making and unmaking simultaneously. Its sure to leave its mark. Each word, being the word of something that creates the world, would be something to be both endured and praised, forever inscribed on your psyche. Even the _memory_ of pure divinity would likely be loaded with some power. I could imagine there being rituals and the like that could use the simple memory of the truly divine as a component. Cultists/whatever seeking to find a true prophet who heard the true word with their puny mortal ears and survived..
How much is the word of God worth? And after such a discussion, I could not see how your character wouldn't gain a level of Priest/Cleric/Diabolist/whatever. How could you not have some type of faith after that? Talking to your god takes faith OUT! and it becomes FACT! OK, guys, sh!t just got real. Apparently, I will be GMing a game about witches. Covens. Building edible edifices and baking fat German children. That sort of witch thing. Now, some demons are bound to make an entrance sooner or later, and perhaps the PCs may glimpse the Lightbringer himself (ol' Lu, the Big Red, El Diablo, that guy). Any input on how to portray infernal forces in an original way is welcome. I'll up the difficulty - ideally, the portrayal should be such that PCs don't immediately think "Gee, serving Lucifer sounds like a really stupid thing to do." The Anime Blue Exrocist provides an interesting look at demons and the like. Hard to get into it without dropping spoilers though. Make the big S a sympathetic character, he's in it for the long, long con, so he'll hold back on the hellfire and head rotating and stuff. He's the aggrieved party, champion of freedom. Of course, all he'll do is lie masked with semi-truths the PCs want to hear. Ideally all your PCs have goals and aspirations he can use. Since he is the big S he can know their secrets regardless if they have told another mortal soul or not - he can read hearts, especially if there are sins involved.